epexegesis: "Warned miraculously from heaven"
Continuing where I left off in this series, with some insights from the Venerable Bede (672-735 A.D.), I want to share some thoughts from two more important theologians from that same influential era. The first worth mentioning is Rabanus Maurus Magnentius, a Benedictine monk who became the archbishop of Mainz (Germany) in 847 A.D., and is venerated in the Roman Catholic and Easter Orthodox Churches for his important contributions to the life and faith of the Church. The second important Christian theologian is Remigius of Auxerre (841-908 A.D.), a Benedictine monk and Latin scholar who taught and wrote copious amounts of works on Biblical exegesis, Christian theology, Greco-Roman classics, Platonic and Neo-Platonic philosophy, Latin grammar, and liturgical philosophy. As we shall see momentarily, both of these highly influential Christians interpreted important Gospel prophesies of Jesus as being fulfilled in the first century, particularly in the destruction of Jerusalem and the end of the Old Covenant administration. Also, as we survey the comments of Rabanus and Remigius, keep in mind what I have shown in earlier posts (here and here), that the thoughts expressed below were also handpicked by St. Thomas Aquinas, a Doctor of the Church who was commissioned by Pope Urban IV to compile a commentary on the gospels, to aid the Church in gaining a deeper understanding of the Christian faith. Rabanus: The historical sense is clear, that in the forty-second year after the Lord’s passion, the city and temple were overthrown under the Roman Emperors Vespasian and Titus. Remigius: So it was ordained of God, that as soon as the light of grace was revealed, the temple with its ceremonies should be taken out of the way, lest any weakling in the faith, beholding all the things instituted of the Lord and hallowed by the Prophets yet abiding, might be gradually drawn away from the purity of the faith to a carnal Judaism. Remigius: The Lord continuing His walk arrives at Mount Olivet, having by the way foretold the destruction of the temple to those disciples who had shewn and commended the buildings. When they had reached the Mount they came to Him, asking Him further of this. …For Mount Olivet has no unfruitful trees, but olives, which supply light to dispel darkness, which give rest to the weary, health to the sick. And sitting on Mount Olivet over against the temple, the Lord discourses of its destruction, and the destruction of the Jewish nation, that even by His choice of a situation He might shew, that abiding still in the Church He condemns the pride of the wicked. For nation shall rise against nation, and kingdom against kingdom:and there shall be famines, and pestilences, and earthquakes, in diverse places. Rabanus: Or, this is a warning to the Apostles not to flee from Jerusalem and Judæa in terror of these things, when they should begin to come upon them; because the end was not immediately, but the desolation of the province, and the destruction of the city and temple should not come till the fortieth year. And we know that most grievous woes, which spread over the whole province, fell out to the very letter. …Nation shall rise against nation, shews the disquietude of men’s minds; pestilences, the affliction of their bodies; famines, the barrenness of the soil; earthquakes in diverse places, wrath from heaven above. Rabanus: For what desert so many evils are to be brought upon Jerusalem, and the whole Jewish province the Lord shews, when He adds, Then shall they deliver you up, &c.
Remigius: As the capture of Jerusalem approached, many rose up, calling themselves Christians, and deceived many; such Paul calls false brethren, John Antichrists. …Whoso shall endure unto the end, i.e. to the end of his life; for whoso to the end of his life shall persevere in the confession of the name of Christ, and in love, he shall be saved. …For the Lord knew that the hearts of the disciples would be made sad by the destruction of Jerusalem, and overthrow of their nation, and He therefore comforts them with a promise that more of the Gentiles should believe than of the Jews should perish. …But the whole passage might be referred to the end of the world. For then shall many be offended, and depart from the faith, when they see the numbers and wealth of the wicked, and the miracles of Antichrist, and they shall persecute their brethren; and Antichrist shall send false Prophets, who shall deceive many; iniquity shall abound, because the number of the wicked shall be increased; and love shall wax cold, because the number of the good shall diminish. [Marginal gloss by St Thomas]:1 But it is possible to maintain both applications of the passage, if only we will take this diffusion of Gospel preaching in a double sense. If we understand it of fruit produced by the preaching, and the foundation in every nation of a Church of believers in Christ, as Augustine (in the passage above quoted) expounds it, then it is a sign which ought to precede the end of the world, and which did not precede the destruction of Jerusalem. But if we understand it of the fame of their preaching, then it was accomplished before the destruction of Jerusalem, when Christ’s disciples had been dispersed over the four quarters of the earth. Whence Jerome says, (Hieron. in loc.) I do not suppose that there remained any nation which knew not the name of Christ; for where preacher had never been, some notion of the faith must have been communicated by neighbouring nations. Let him which is on the housetop not come down to take any thing out of his house. 1 This Gloss appears to be a note of S. Thomas, in confirmation of the view of S. Chrysostom, which refers this to the taking of Jerusalem. cf. Iren Hæres. i. 2 and 3. 2 Notice that Remigius utilized the Ecclesiastical History of Eusebius (and by extension, Josephus and Hegessipus) that I cited early on in this series to conclude that Christians in Judea were warned "miraculously from heaven" about the destruction of Jerusalem. "This" he writes, "we know was so done when the fall of Jerusalem drew near." 3 Thomas Aquinas. (1841). 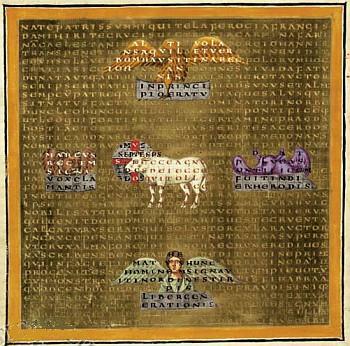 Catena Aurea: Commentary on the Four Gospels, Collected out of the Works of the Fathers: St. Matthew. (J. H. Newman, Ed.) (Vol. 1, p. 799-816). Oxford: John Henry Parker.